When I first started with a WordPress website, the theme shop seemed like a sweet shop and I was a kid trying to pick my favourite. Then the realisation came – there are some wonderful free themes out there but there are also some limitations that are inherent to them. That’s when the urge for a paid theme came along and when I found Elegant Themes. 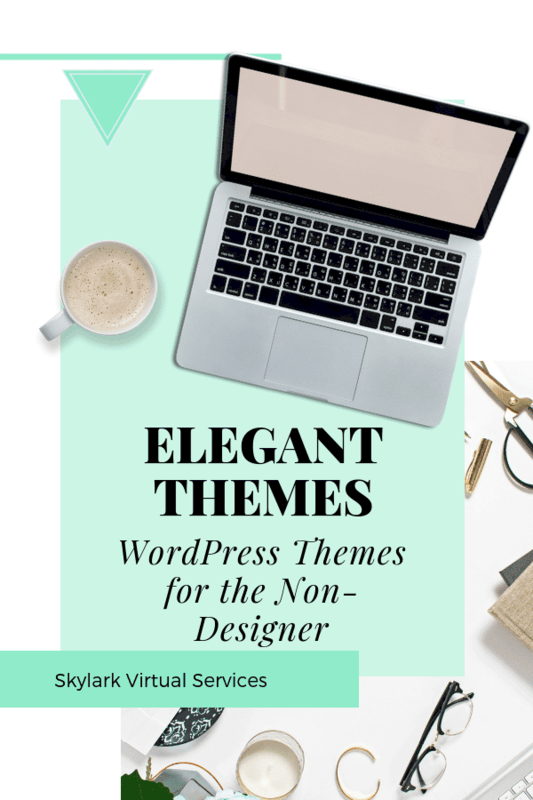 Elegant Themes is actually a series of WordPress themes that are packaged into a single yearly subscription. The most well known of them is the Divi theme but there are other ones including Extra which is a magazine style layout and more. All of the themes are responsive, so you don’t need to worry about your website being mobile friendly. Perhaps the biggest benefit to Elegant Themes for me is the Divi Builder. This is a front-end editor or page builder that is perfect for the non-designer. It allows you to create pages and posts that are completely individual to your needs without needing to learn a single line of code. 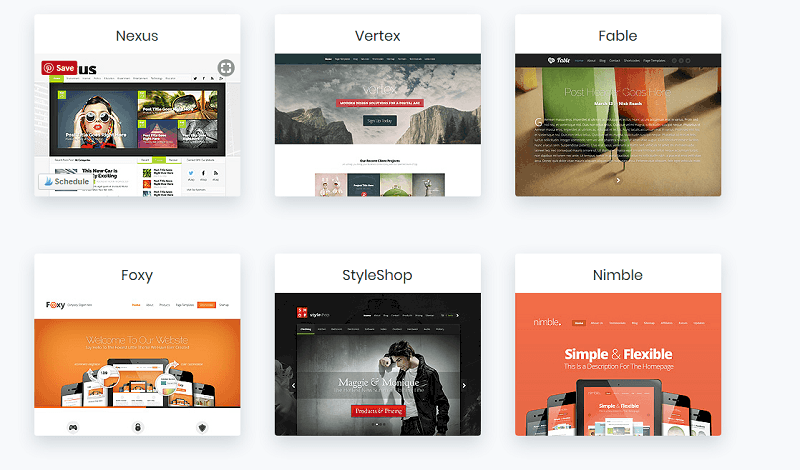 The package also includes some plugins specifically designed to work with the themes. 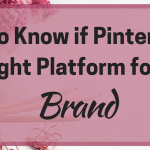 These include Bloom, an email opt-in plugin and Monarch, a social sharing plugin. In terms of cost, there are two options. You can pay for it annually or upgrade to a lifetime package to save a lot of money. It costs me $96 (including UK VAT) a year and the lifetime access is a one-time fee of $249. This is unlimited use, so you can use it on as many websites as you like and includes all plugins, themes and premium support. You can also use specialist full-width modules that allow you to use the whole of the screen as well as different layouts to include sidebars or to work without one. Another really useful addition to the package is the premade layouts for the Divi builder. 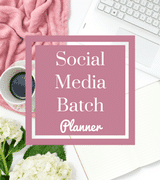 These are amazing if you are not a designer like me and they come in themes around a particular type of business – but you can easily adapt these to suit your business. The layout packs are free and there’s a new one being released every week. These are automatically added to the builder and you can use them as soon as they are released. Each pack contains a range of pages including homepage, blog, portfolio, contact us and more. You can easily change colours, move elements around, add your own images and much more. 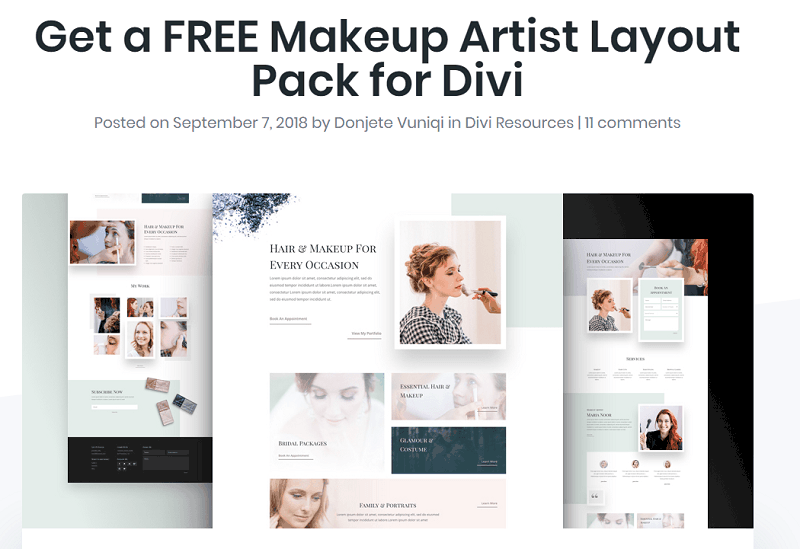 You can also create a layout then save it to the Divi library so if you get that perfect layout and want to use it repeatedly, then you can load it on a new page, edit where needed and then you are ready to go. 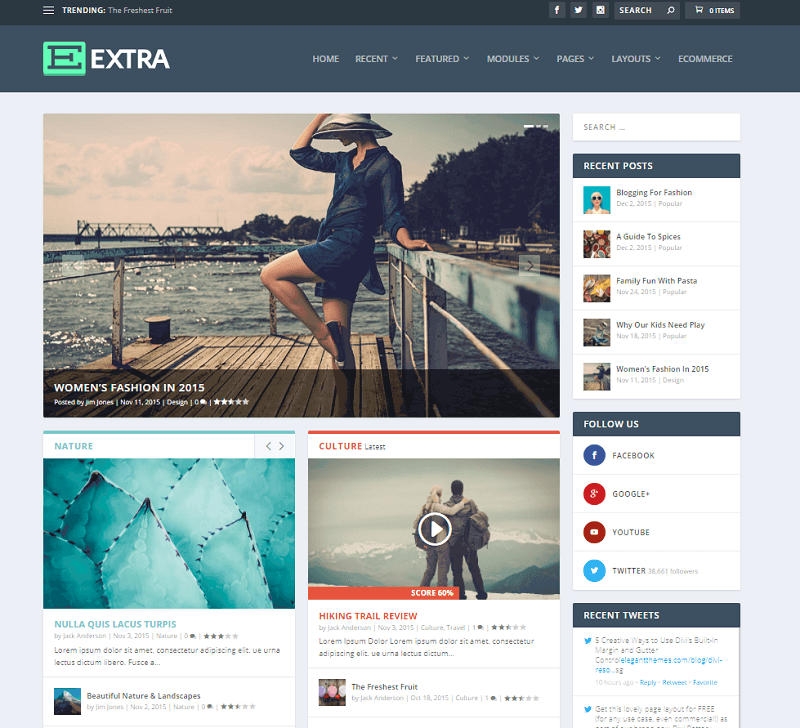 Extra is Elegant Theme’s magazine layout theme and has a few special features that aren’t available on the other themes. 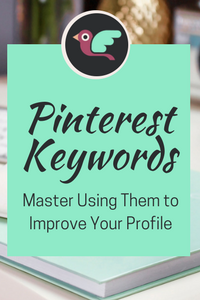 One of these is the category builder which allows you to easily create category pages for your blog categories. Default settings mean every new category will have a page set up in this same style. You can also add ratings and reviews to posts with a star-system. There are also a few purpose-built widgets for the Extra theme within the Divi builder. You can see these being labelled ET at the beginning and all fit in with the magazine style of the theme. If you want a news style website or want the focus to be the content without a traditional homepage, then this theme is excellent. There is also a range of other themes that are classified by their style and main features. These include both personal and business themes, magazine and portfolio themes and even blog and app best themes. Each comes with standard looks and features but as with all Elegant Themes products, you can adapt them and change them to suit your branding. The Divi Builder is available as a plugin, so you can technically use it without a subscription but obviously, you don’t get access to features and the themes. There are two other plugins included in the package. Bloom is an email opt-in form which at first might seem unnecessary as most providers such as ConvertKit let you make opt-in forms and use shortcodes to add them. But the thing I really like about Bloom is you can specify categories for a particular form to appear in. 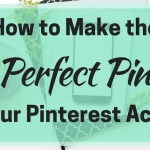 So if you have an opt-in for your Pinterest posts, you can set the plugin so that Form 1 only appears on your Pinterest category posts. Monarch is a social sharing plugin that helps you get more shares and followers. It is a lightweight plugin that lets your visitors easily share to up to 20 different networks and you can select which ones show where. There are floating sharing buttons as well as on the top and bottom and even on images and videos. There are also pop up and fly-in options. 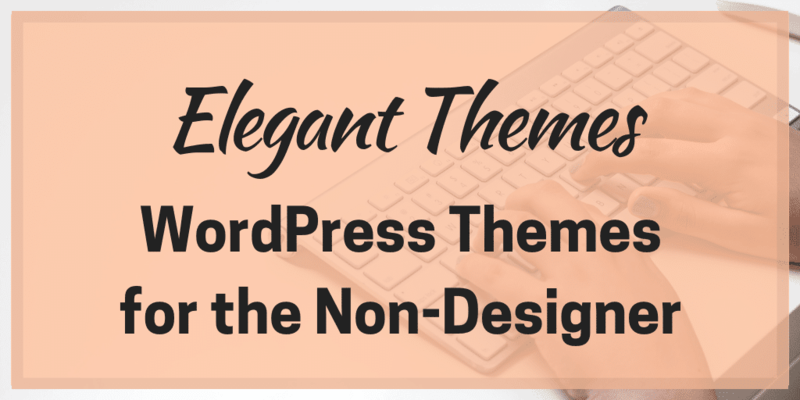 Elegant Themes has a solid support system involving tech support, community forums and a lot of help videos. I’ve used them a few times to sort problems and you get a prompt response and easy to follow instructions. Their tutorials are comprehensive and include both video and text options – these are invaluable when you are learning about Divi, so you can get the most of the different features. They also have a YouTube channel with lots of help and how-to videos on it. Before I started with Elegant Themes, I heard people issue dire warnings that once you use their themes, you can never change. To be honest, I’m not sure why you would. They are constantly evolving and adding more features as well as enhancing the Divi Builder. I currently have six websites and all of them use Elegant Themes – mostly Divi but a couple on Extra. The more I use it, the more I can do with it and the easier it gets. But even without any knowledge, you can quickly make a smart, user-friendly and responsive website. If you want to chat more about the themes, the builder or any of the other elements, just pop questions in the comments below and I’ll answer what I can. And if you are interested in purchasing either a yearly or lifetime package, this is my affiliate link. This is interesting! I didn’t know about it. I’ll check it out! Thanks for sharing ♥️ ♥️ By any chance you are interested on doing collaborations, you can check out the collaborations portal of Phlanx.com and connect with amazing brands!